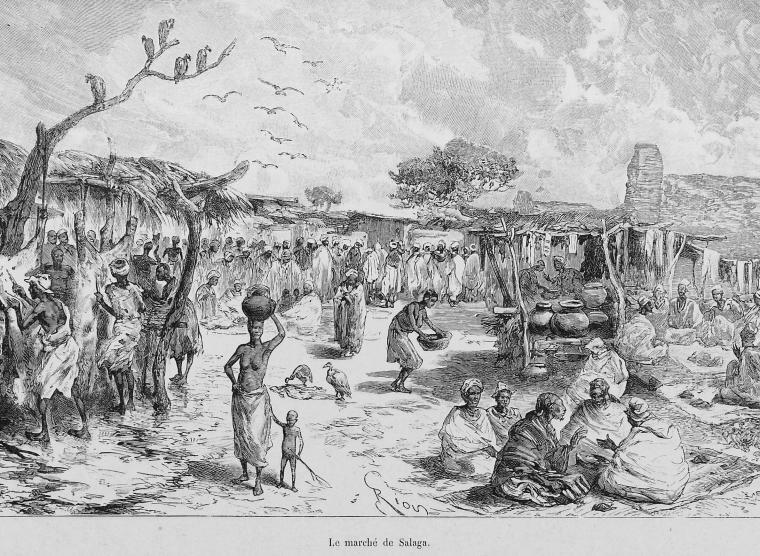 Etching of Salaga Market 1892, by Édouard Riou. Image via Wikimedia Commons. 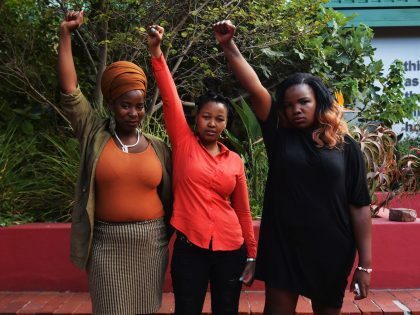 It is difficult to reconstruct the experiences of African women at the close of the 19th century when the continent was in the liminal space between autonomy and imperialism. 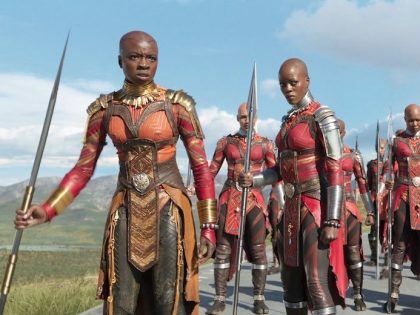 This challenge of centering women’s lives within historical processes stems from the dearth of contemporaneous written narratives, diaries and correspondences by and about African women. The most that we have, with some notable exceptions, are glimpses of women’s aspirations, fears and daily concerns. Therefore, we must piece together the fragments, consider the broader historical and cultural context of the time, to re-envision women’s experiences. In other words, we must speculate. It is not an easy task, but it is an important and necessary one if we are to truly think historically about Africa’s past. Ayesha Harruna Attah performs this task of historical speculation expertly through The Hundred Wells of Salaga, her captivating and richly rendered third novel. She beautifully presents women playing roles in events leading up to and during the Salaga Civil War of 1893 in what is now northern Ghana. As she weaves her tale through well chronicled history, she offers a convincing argument: there are far richer and more complex stories to the history we believe we know, and it necessarily includes women. Salaga was a regional trading hub and the Kpembe polity’s most important market town. The powerful Asante kingdom to the south conquered Salaga and Kpembe in the 18th century and incorporated Salaga within the broader West African trade network, primarily through the kola trade, but slavery and the slave trade helped define Salaga’s regional importance. Attah’s story builds on historical events in Salaga and Kpembe after the British conquest of Asante, which left Gonja economically and politically independent within a neutral zone between competing German, French and British territorial interests. These known historical events form the broad context for Attah’s story. The specifics center on Gonja’s Kanyase clan and its leaders’ responses to rival clans’ depriving them of their place in the rotation to become Kpembewura, chief of Kpembe. Historically, power alternated among three “gates,” or clans with legitimate claims to authority: Kanyase, Lepo and Singbung. The Kanyase are prepared to seize power by force, a fact that shapes the tension in the novel’s early chapters. These political troubles occurred at an inauspicious time in West Africa. European empires were absorbing African polities of various sizes and influence. Asante had fallen to the British, as would the Sokoto Caliphate farther east. To the north, Samory’s Mande Empire was on the verge of collapsing under the weight of French assaults. African groups contributed to the political disarray. Directly north of Gonja, the Zabarima sowed political instability throughout the region with incessant raids on small towns and villages. At the opening of The Hundred Wells of Salaga Aminah and Wurche, Attah’s two main characters, seem to exist in separate worlds. Aminah, strikingly beautiful—everyone says as much—and incredibly resourceful, comes from a family of traders in the village of Botu, a rest stop along the caravan route to Salaga, where she sells food to caravan traders. Debates on slavery and slave raiding among traders, as they consume the food that Aminah sells them, distresses her. The issue had been widely debated for over a century throughout the Sahel, among marabouts, clerics, traders and herders: who were legitimate targets of enslavement? The traders Aminah listened to in Botu argued that the Zabarima raiders were unjust. They blurred the lines between legitimate and illegitimate slaving, which weakened social stability. Evoking the changing times and prevailing insecurity, one trader laments, “There are people who become slaves, and there are people who should be left alone. Those men come for anyone. No one—high-born or low—is safe from their raids. And they are giving people who ride horses a bad name.” Reports of these raids come from villages that are ever closer to Botu, and begin to discourage caravans from passing through Botu. Aminah is keen to keep her father and twin sisters close. 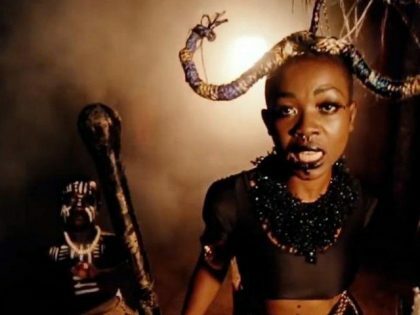 Wurche is not beautiful like Aminah: “The old ladies of Kpembe said Wurche should have been born a boy, that all she lacked was a lump between her legs. They said she had pebbles for breasts and a platter for buttocks.” She is heroic, wise, and emotionally and physically strong. Had she been born a boy she would be leader among the Kanyase and, perhaps, all of Gonja. She is a royal of the Kanyase “gate,” the daughter of the man who believes he was wrongfully deprived of the office of Kpembewura. The Kanyase face a quandary, rooted in Gonja’s economic and political crisis. Were Europeans an existential threat or an antidote to Gonja’s internal political turmoil? Wurche’s father often seeks her counsel. His respect for her is evident. But they see the challenge the Kanyase and all of Gonja face differently. She remains adamant that Gonja unity rather than civil war is essential, and she has deep distrust of the white men who have been visiting her father. But his position has been buttressed by his alliance with these white men, who only recently arrived in the area but quickly asserted influence and power, and the bond he secured with the neighboring Kingdom of Dagbon. Events set in motion by the handsome and enigmatic Moro, a capturer and seller of slaves—although we learn that he is much more that that—bring Aminah and Wurche together and demonstrate how intricately bound their lives and worlds have been all along. I was invested in these characters after the first few pages. I cared what happened to Aminah and Wurche, and the rich cast that Attah built around them. I fell into their world easily, as the chapters alternated between Aminah’s and Wurche’s points of view. Attah allowed them to exist within her construction of their temporal environment. There is no hint that European conquests and colonial rule are part of an inevitable future awaiting the Gonja, the Grunsi, the Dagomba, and other peoples of what will become the Northern Territories of the Gold Coast. Attah helped me imagine how these developments might have appeared to those who lived through them. 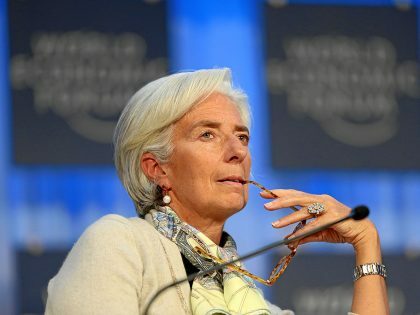 She allowed me to believe, if only for a moment, that Gonja’s political independence might withstand Europeans’ external threat, its own internal rapidly brewing internal political conflicts, and, in the midst of this two women would succeed and fail on their own terms. With The Hundred Wells of Salaga, through the eyes of two tenacious women, we see the region’s history, however fictionalized, on its own terms. 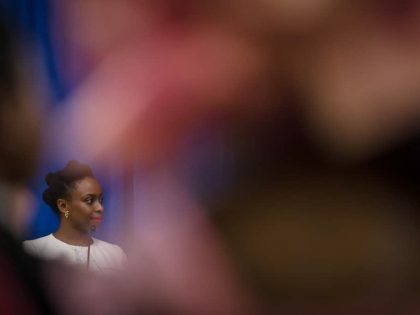 Neoliberalism’s model of social justice: the rich prosper, but an appropriate percentage of them are minorities or women. 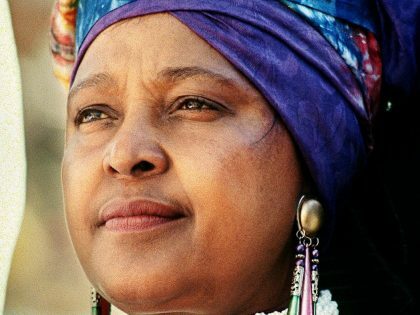 An in-depth look at the life and times of Winnie Mandela largely in her own words.